Not on each other but on the floor! and one to mend the hole in…. (insert child or adult’s name! )’s smelly socks!! Dog, cat, froggy…….Dog, cat, froggy. I’d stand outside with my mouth open wide going ah ah ah ah ah ahhh! 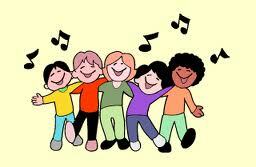 Below are some of our children singing some of their favourite songs. Click on the links to hear our lovely singing voices. Please do not submit recordings to X Factor without first asking for parent’s permission! !